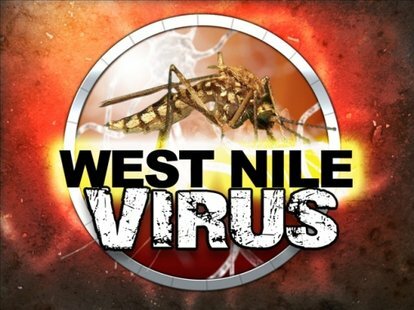 The first human case of West Nile Virus for the DC region this season, was reported by Maryland health officials this past Friday, August 10th, 2012. A Central Marylander adult has been infected and is the state’s first confirmed case of the disease for this year. West Nile Virus has also been detected in a pool of mosquitoes collected in Montgomery County. Many different species of aphids can feed off of plants in your garden. Crape Myrtle aphids, in particular, can quickly grow to damaging numbers causing problems for what is a generally low-maintenance plant. While feeding, the aphid injects saliva into the plant, which causes pale yellow spots to form on the leaves, and also excretes a sweet “honeydew” substance onto the leaves. This sticky “honeydew” creates an ideal environment for sooty mold (a black fungus) spores to form. Black sooty mold often coats the plant’s leaves, creating an eyesore and interfering with photosynthesis. Use natural predators of the aphid, such as: ladybugs, lacewings, finches, mockingbirds, and woodpeckers (Engler). Wash off the plant using a high pressure stream of water. This can help to remove aphids, but it needs to be repeated regularly to gain control over them. 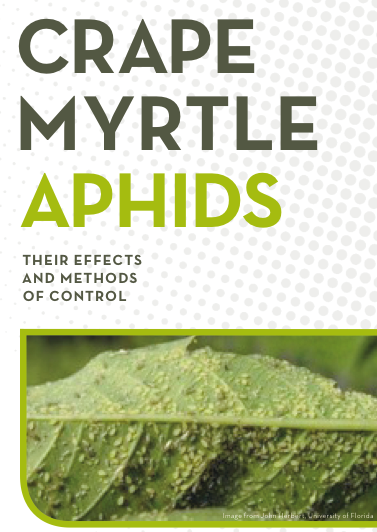 Use particular chemicals and insecticides to control Crape Myrtle aphids. Some examples of these include: Permethrin and other Pyrethroids, Insecticidal Soaps, Horticultural Oil, Neem Oil, Malathion, and Acephate (Doubrava). Our insect control team here at Mosquito Squad of Greater Washington DC hopes that this information helps you with any aphid infestation that your Crape Myrtles may have. Our company is proud to offer a variety of outdoor pest control services, including aphid control which we’ve seen as in issue here in sections of Northern Virginia, DC and parts of Maryland. If you have Crape Myrtles that are suffering here in the Greater Washington DC region, please feel free to e-mail us, give us a call at 571-830-8002, or contact your nearest horticulturist for more information on aphid control. With the warm weather, in fact one of the warmest winters the US has experienced in many years, the bugs are expected to come out in full-force earlier this spring. Here in Washington DC, this winter is on track to being one of the top ten warmest winters ever recorded, and many insects are emerging from hibernation early. That means over the next few weeks we’ll see insects like stink bugs, beetles, ants, wasps and termites out instead of in late April, when pests typically appear. In some places, the onslaught has already begun: “We’re seeing insects out there that we don’t usually see this time of year,” says Missy Henriksen of the National Pest Management Association, who listed such annoyances as stink bugs and box elder bugs. “Several states have even reported tick sightings, which is especially worrisome as people head outdoors to enjoy the weather and are unprepared for tick encounters,” she says. Also, mosquitoes are expected to be in abundance this year due not only to a mild winter, but also tropical storms last year. To find out more, be sure to read this USA Today article “Warm weather breeds early bug bonanza” by Doyle Rice from Feb. 22, 2012. And to battle the bug problem in your own backyard, be sure to contact Mosquito Squad of Greater Washington, DC to find out how you can “take back your backyard” and enjoy your outdoor living space. The Brown Marmorated Stink Bug – What Can YOU Do To Tackle Annoying Stink Bugs? Right now in Maryland, DC and Northern Virginia, The Brown Marmorated Stink Bugs are preparing to take a winter vacation in the cozy warmth of your home. Are you ready to control this smelly nuisance? Worry no more, Mosquito Squad’s “busters” are here to help rid you of this annoying pest! Currently, stink bugs are nesting in your home by the hundreds, maybe even more. If threatened, the stink bug releases the characteristic foul odor that gives them their name. If you have already seen or smelled one or two, then there are many more of their friends hiding out in your walls and attic. 1. 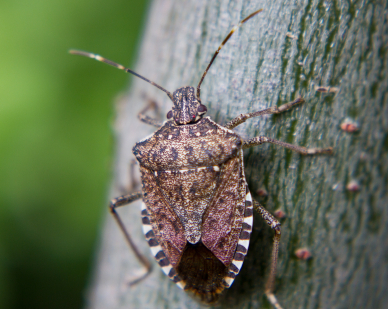 Prevent stink bugs from getting inside your home to overwinter. During the summer, use caulk to seal any cracks around windows, doors, utility access points, chimneys, siding, trim and fascia. Seal attic and foundation vents and weep holes with wire mesh or screening. If the stink bugs have already invaded your home, then do not seal all of the cracks, as this will trap the bugs indoors. 2. Control stink bugs once they get inside by caulking around baseboards, exhaust fans, light fixtures, and trim to prevent stink bugs from accessing interior rooms. 3. Vacuum! If you spot a stink bug, dead or alive, vacuum it up. Do not step on it as they will release their foul odor as a defense mechanism and also upon death..
4. Spot spray plants that are damaged while the stink bugs feed with an appropriate insecticide. The most common time to spot plant damage caused by a hungry stink bug is late July and August. 5. Control stink bugs before they get inside by spot treating with a microencapsulated or wettable powder insecticide around windows, doors, attic vents, and other locations in the early fall and spring. Also, screen and caulk from the inside, especially potential stink bug access areas that are too high to reach safely from outdoors. 6. Call Mosquito Squad for stink bug relief (571) 830-8002! If stink bugs die inside your walls, attic, or other recesses, other insects, such as carpet beetles, will invade and feed on the dead stink bugs. This is why prevention and control are so important. Please feel free to contact us here at Mosquito Squad if you would like more information or if you would like help in controlling this smelly nuisance! Mosquito Squad’s New Marketing Intern! Hello my name is Peter and I will be the new marketing intern for the Mosquito Squad of greater Washington D.C. this summer. I am going into my last semester at George Mason Univeristy and double majoring in marketing and finance. This is my first week at work and look forward to the upcoming projects that I will be able to be a part of. I feel very privileged for this opportunity and look forward to sharing my experiences with the community that surrounds Mosquito Squad. This week, June 20-26, 2010 is Mosquito Control Awareness Week. Locally, here in the Washington DC metropolitan area, local county departments such as the Fairfax County Health Department’s Disease Carrying Insects Program have been raising awareness through their “Fight the Bite” campaign and educational material on their website. You may have seen signs or banners for “Mosquito Control Awareness Week” as you were driving along Fairfax County Parkway or other major thoroughfares this week, and with the mosquitoes out in full force this summer, the hope is to raise awareness of mosquito-borne diseases and how you can protect yourself. For personal residences you can do a few practical things to reduce the number of mosquitoes such as eliminate mosquito breeding sites around your home. You can also call a mosquito control professional to come out and apply insecticides. Our company, Mosquito Squad of Greater Washington, DC, offers mosquito and tick control services for both personal residences and commercial sites inside the Beltway. To find out more information about our barrier spray services and how you can “fight the bite” in your own backyard, please visit our website. It’s been a whirlwind week for me, on a sad note I regret to report that my Grandmother died at the age of 86. It was a little unexpected for me, I had been planning to visit her in the near future but by providence it did not come to pass. I am grateful to say that even with the sadness of the occasion my family was able to come together and embrace each other and I was glad to have had the time with them that I did. Having traveled with my family to California and back it seems that everytime I get in a plane for the cross country trip I get sick, Im not sure if its my sisters kids or germs on the plane but on the last trip my son and I got swine flu and now I dont know what I have, but in spite of my being sick, I was able to head down to Richmond right after my flight arrived at IAD to attend the Mosquito Squad Annual Meeting. We just completed the annual meeting for Mosquito Squad and the excitement I now have for the 2010 season is exhilarating. The Franchise system now has close to 50 locations and in two years we expect to have close to 200 locations, I believe this is very doable. We covered numerous topics in the 3 days we had together, having been a part of Mosquito Squad for 3 years now I’m excited to see how the system has grown and developed. For 2010 5 new franchises will be operating in the metro area,we have franchises in: Montgomery County, Fairfax County and in parts of Howard County, Anne Arundal County, Loudon County and Prince William County. 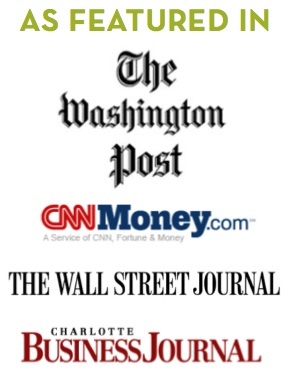 I’m thankful for the Washington Post‘s article last year for featuring us in the Home section, it seems to have brought some attention to the Mosquito Squad Franchises. While at the meeting Jennifer was able to accept an award for us, we were “the most forward thinking” we were excited to receive it and were grateful for the recognition of our efforts to help improve the franchise system. So thank you Chris Grandpre, Scott Zide, Boyd Honeycut and the rest of the Outdoor Living Brands team for the recognition. We are looking forward to the upcoming year and we hope to have many more upcoming blog posts for you.